Hype video? Jordan Kovacs and Roy Roundtree can barely keep a straight face while asking fans to show up on time early. The biggest storyline going into this game is the status of Denard Robinson's elbow/hand/nerve injury. To date, no one outside of Denard, the brain trust of Brady Hoke, and Michigan's team doctors know just how well the assumed recovery is going. What we do know is that nerve injuries such as this take time to heal. So whether or not Denard is going to be able to function as quarterback will certainly not be determined until gametime. Hoke has remained pretty mum on the whole issue, which would lead us faux media-types to jump to conclusions, because frankly, that's what we do. That said, Michigan fans should feel much more confident about the quarterback position after Devin Gardner's performance last week at Minnesota. Devin showed a certain level of poise and confidence that I haven't seen at that position in quite some time. Even with the struggles of the running game and the play of the offensive line, Devin showed that with only a week to prepare for being literally thrust back into the quarterback spot, he could step up and deliver. I cannot overstate enough how impressive that was. The running game/offensive line struggles are becoming more than just an annoyance, and starting to venture into worrisome category. The interior of the OL is where there seems to be just no cohesiveness whatsoever. Even with clear blocking assignments, defensive tackles are going untouched. Blitzes are being missed. Running lanes rarely appear, and when they do, they're not big enough. Brady Hoke spoke to this point on Monday. "I thought we were very physical (in practice Tuesday," Hoke said. "You've heard me say the term 'hearing football,' and I heard a lot of football (Tuesday). Which was a good thing. "They've practiced hard, but we've got to make sure we're consistently stacking them together." He also didn't rule out possibly shuffling the lineup a bit. Hoke said that he's considered inserting both redshirt freshman Jack Miller and sophomore Joey Burzynski into the lineup -- and through this week in practice, he says both have gotten more snaps up front. "Those guys have gotten some reps with the ones," Hoke said. "We'll see. I can't tell you until we finish (physical) practices. "And we really don't finish until Thursday." It's safe to to say certain members of the original starting lineup which we've seen all year have regressed as the season has gone on. For those guys, both 5th-year seniors, the time is now to step up. Also a major question mark going into this game is the current status of backup QB Russell Bellomy. Word is that he was actually out for Minnesota last week, even though he dressed. Hoke has also been very quiet about Bellomy, refusing to address his situation. So moving forward, unless we know more, suspect Bellomy to not be a viable option should Devin go down and Denard can't go. That's a worrisome thought. That's gonna fester. Much like Illinois' Nathan Scheelhaase, Kain Coulter is the heart and soul of the Northwestern spread offense. Think of him as a scrappier version of Denard Robinson. He's a true playmaker though. He has breakaway speed and doesn't always line up at the quarterback spot. When he doesn't, he's usually split out at WR, with Trevor Siemian in at QB. But don't confuse NU's two QB system with more successful passing attacks, the Wildcats only average 162 yards per game through the air, good enough for 109th in the FBS. That coupled with Michigan's #1 ranked pass defense, which allows only 145 yards per game, and you have the recipe for a ground assault. 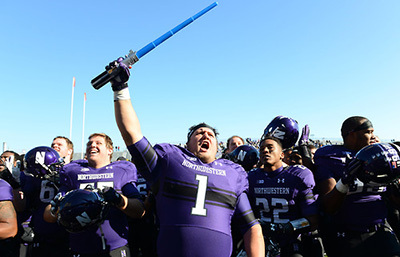 But Northwestern's ground assault is dangerous. Venric Mark is Northwestern's primary running threat. He's averaging 6.5 yards per carry, and has already passed 1000 yards for the season. Between Mark and Coulter, Michigan is going to have to be very sound against the run tomorrow as NU boasts the 13th best rushing offense in the nation. That could suit Michigan very well though, as Northwestern lacks really any sort of huge threat at WR outside of Coulter who's probably not going to be much of a downfield threat anyway. That said, the Wildcats are very skilled at running the spread, and they are pretty good at protecting the football. MZone's Know Your Foe. Hoke's Mad Magicians' 5 NU players to watch. MGoBlog's FFFF. MLive's Kyle Meinke with his 5 Keys to Victory. Previews from MGoBlog, MnB, Touch the Banner, Tremendous and BWS. Northwestern blog Sippin' On Purple's Michigan preview. • Denard doesn't play, but Gardner picks right up where he left off last week. • The OL lineup is tweaked with tangible results. • Michigan's defense continues its dominance at home. • Devin struggles and we find out the hard way who the 3rd string QB really is. • NU's spread is giving Michigan fits, and Mark gets loose. • Michigan's zone coverage gets exploited again.